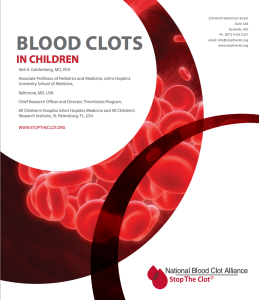 Home / About Clots / Blood Clots in Children Resources / How do we diagnose blood clots in children? Scan: A way to take pictures of something inside the body, such as a blood clot. Ultrasound: A painless procedure that bounces sound waves off the veins to create an image on a computer. The picture shows the veins and the blood flow through them. To see if veins close normally, we use the ultrasound wand to gently press down on the skin and muscle on top of the vein. Computed tomography [CT] venogram: A special scan of the veins done after we inject dye through an IV. This scan gives us a picture of the veins and blood flow through them. IV: A small flexible tube placed in a vein, usually on the inside of the elbow. Magnetic resonance [MR] venogram: A type of Magnetic Resonance Imaging (MRI) scan that allows us to see the flow of blood through the veins. This includes the blood coming from the internal organs going back to the heart. Catheter-based dye study (conventional venogram): A scan that shows pictures of the veins after we put dye in your child’s blood through a catheter or tube. CT pulmonary angiogram: A special scan that uses dye injected through an IV to see the blood flow through the lungs. Ventilation-perfusion (“V/Q”) scan: A special scan that measures airflow and blood flow throughout the lungs. To diagnose blood clots in children’s veins we rely on x-rays and scans. If we suspect a DVT or blood clot in an arm and a leg, we do an ultrasound. We use this to check for DVT or blood clots in the belly or brain. This gives us more detail on a leg or arm DVT or blood clot. We use this to follow-up on one of the other scans if we think your child may have a structural issue with a blood vessel. This can happen with May-Thurner or Paget-Schroetter. We confirm PEs in children with one of two specialized scans.